Macon, Ga. – Reaching a livable income without a high school education often requires adults to advance gradually through adult education programs, job training, and then into a career, a process the BB&T Foundation aims to accelerate with its recent $50,000 award to the Central Georgia Technical College (CGTC) Foundation. Working alongside the College’s Foundation, Economic Development, and Adult Education Divisions, BB&T is funding the BB&T Workforce Investment Program, a collaborative opportunity focused on impacting individuals through short-term education and training programs designed to quickly move participants toward securing and sustaining a livable wage. The College and its Foundation commend the generous support and strong partnership of BB&T. The Workforce Investment Program will provide targeted classes through CGTC’s Adult Education program, which is designed to help individuals successfully pass the GED® exam, and will be aligned with short-term industry recognized training delivered through the College’s Economic Development Division. The three-week program will provide GED® instruction as well as assistance on resume writing, interview preparation, financial literacy and strengthening job skills. By offering over 40 hours of GED® instruction during the three-week timeframe, students will be eligible for assessments of measurable skills gains. Additionally, participants will receive training that will lead toward credentials in Forklift Certification, CPR/First Aid Certification, and OSHA 10-hour for General Industry Certification. The College plans to offer classes in several of its locations across its 11-county service area, anticipating at least 100 participants. To enroll, contact CGTC’s Adult Education Career Opportunity Center at 478-218-3769. 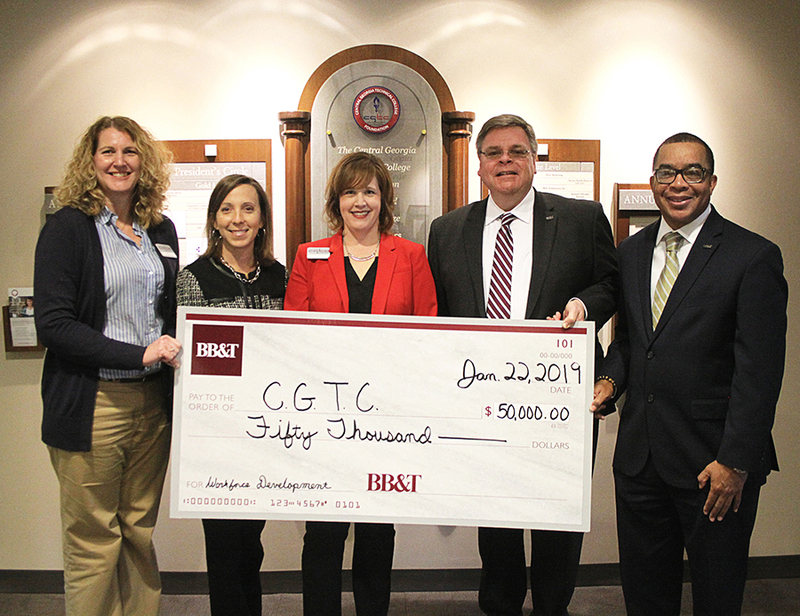 Photo: (From left to right) CGTC’s vice president for Administrative Services, Dr. Michelle Siniard, vice president for Economic Development, Andrea Griner, and assistant vice president for Advancement, Tonya McClure, receive a check on behalf of the College’s Foundation from BB&T representatives, Scott Seigel, market president, and, community development specialist, Derold B. Mciver. This entry was posted in 2019 and tagged Adult Education, CGTC Foundation, economica development, financial literacy, GED, partnerships. Bookmark the permalink.